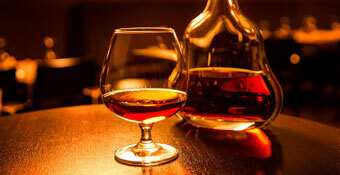 Cognac is brandy which is produced in the French region of Cognac. To be called Cognac, brandy must be twice distilled in cooper pot still and aged for a minimum of two years in French oak barrels. Cognac usually blends different eaux-de-vies to create complexity in flavour. Each cognac house will have a master-taster responsible for blending the eau-de-vie to create a Cognac which is consistent. The quality of Cognac is officially graded as V.S. - Very Special, V.S.O.P - Very Special Old Pale and X.O - Extra Old. Ooh la la.